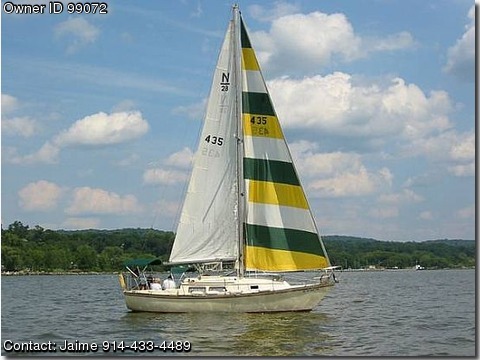 Boat is located in Croton on Hudson,New York.Please contact the owner @ 914-433-four four eight nine or kc2wjo(at)gmail(dot)com...1981 Newport 28II by Capital Yacht, C&C design, length 28 ft, beam 9.9 ft, displacement 7,000 lbs, draft 5 ft, new 14 hp inboard diesel with only 12 hrs run time, 2 new batteries, new prop shaft stuffing box packing, new exhaust manifold, wheel steering, aluminum toe rail, double lifelines, roller-furler head sail, one main sail with two reef lines, two genoas, VHF cabin and hand held radio, enclosed head, hanging locker, two-burner stove, sink, large ice-box. $9,500 or best offer. Five boat stands also available.